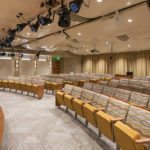 Pilgrim Hall is an intimate, state-of-the-art 100-seat theater, located at Plymouth Harbor on Sarasota Bay, a vibrant Life Plan Community. Founded in the late 60s, Plymouth Harbor on Sarasota Bay has grown from its original high rise to serve residents along the continuum of care, with independent living at its core. 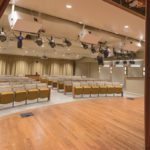 The vibrant community offers a variety of arts and cultural opportunities, and its in-house performance center, Pilgrim Hall, was in need of rejuvenation and increased accessibility. Working with a highly engaged committee from Plymouth Harbor, WBRC teamed with acoustical consultant Siebein Associates, Inc., A/V expert Integrity Sound, Chehayeb and Associates for lighting, Stepanek-Lewis & Associates for HVAC redesign, and interior designer Marne Kaplan to design a renovation that maximized Pilgrim Hall’s potential on its existing footprint. The floor and ceiling of the 1966 structure is comprised of a post-tension concrete slab poured in place, limiting what could be affixed to the floor. 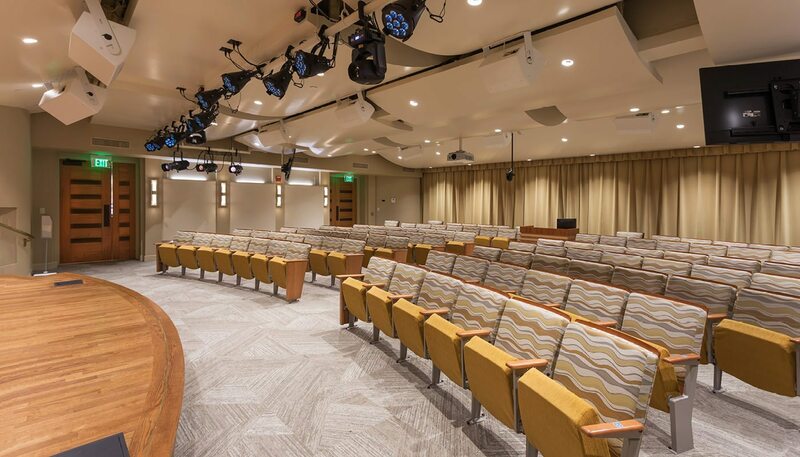 The new seating worked within these parameters, providing 95 fixed seats with 10 removable to accommodate scooters or wheelchairs. 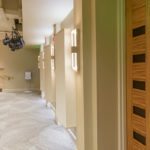 The space plan included a backstage nook for Plymouth Hall’s baby grand piano, used daily by a world-class concert pianist who is also a resident. 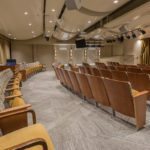 Accessibility enhancements include widening of the theater entrances and ramp access to the stage. 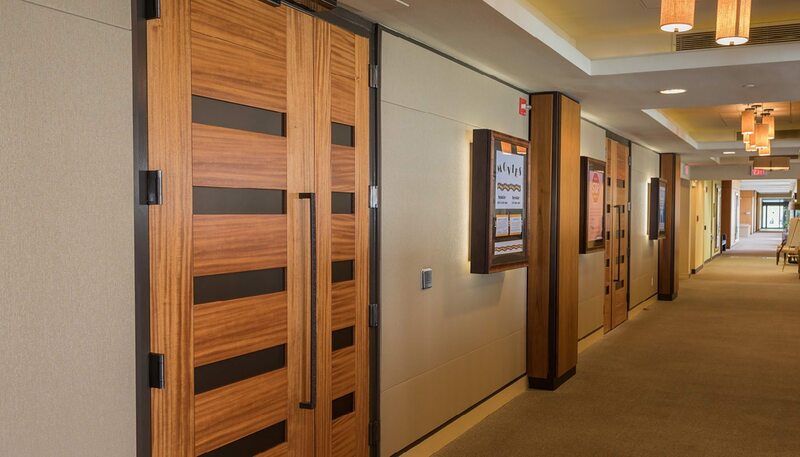 To expand seating capacity, the back wall of the theater is retractable, opening into the dining area to enable overflow seating. 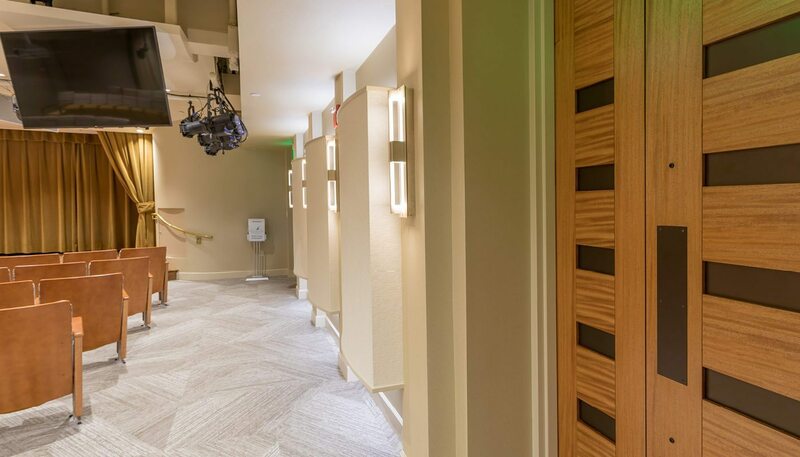 Upgraded video technology, including a new HD pan/tilt/zoom video camera, allowed the team to create three satellite areas for remote viewing and listening at Plymouth Harbor’s club room, chapel, and wellness center. 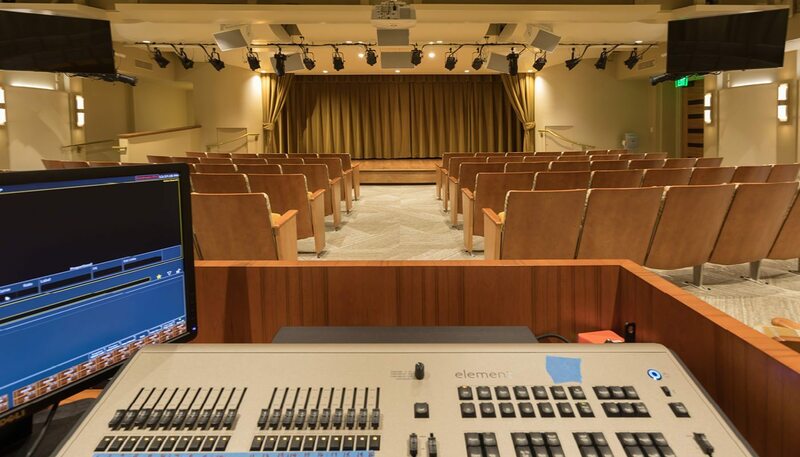 Inside Pilgrim Hall, two 55” live video monitors give audience members additional visual access. 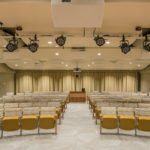 The chosen technology for this project needed to accommodate a wide variety of performance types, as well as provide the audience with the best possible visual and acoustical experience. 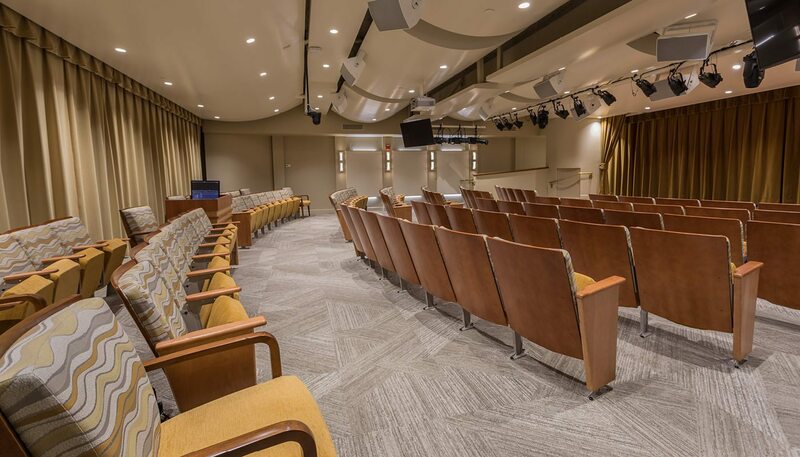 LED theatrical lighting for the stage, controlled remotely via iPad, is joined by recessed ceiling and sconce lighting in the theater. 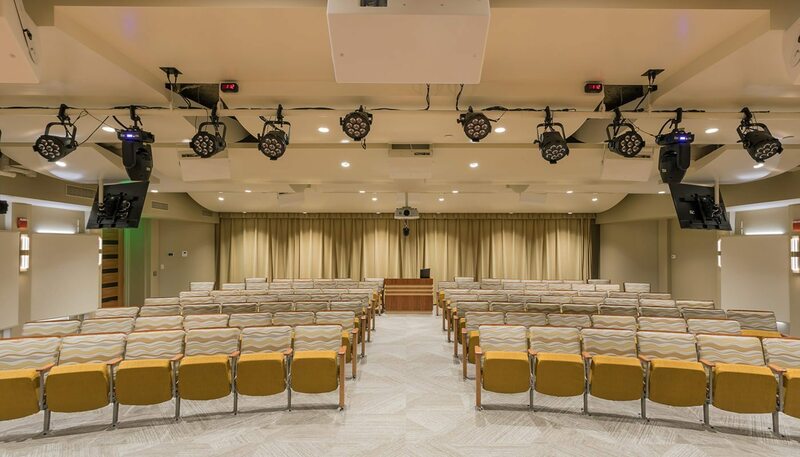 Acoustical treatments on the walls, ceiling, and exterior corridor maximize sound quality inside the hall and minimize sound leakage into adjacent spaces. 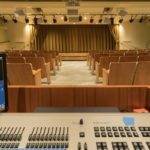 The new integrated audio system with surround sound can be controlled remotely or at a portable sound booth in the back of the hall. 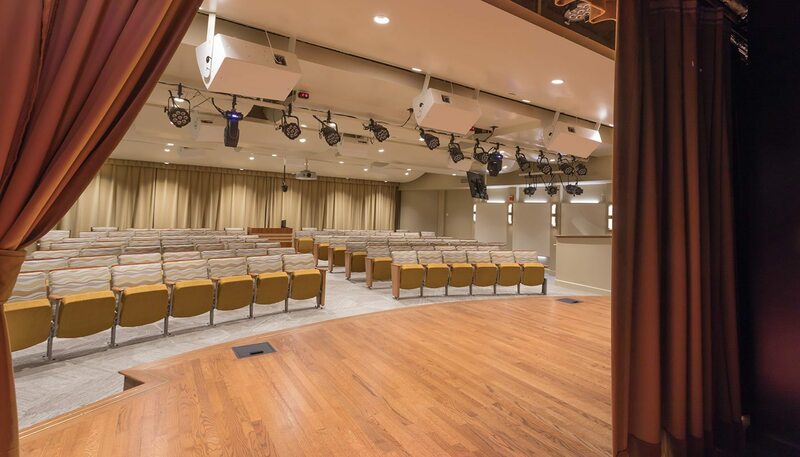 Selection of furnishings, flooring, fixtures, and finishes was key to the success of Pilgrim Hall’s new look, feel, and functionality. 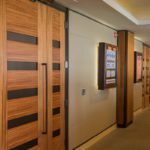 A harmonious blend of colors and textures, including wave-patterned seating in honor of Plymouth Harbor on Sarasota Bay’s waterfront location, work harmoniously with the adjacent lobby, dining area, and overall community aesthetic.